Rey and Ron were driving the shuttle carts. All in all a very active group of people and a joy to be with. Back to Sundance in Casa Grande for the final week gave us an opportunity to tick off the last few items on our “To Do” list. We have a white board on the fridge door that has places for maintenance items, grocery needs and a spot for when the black tank needs emptying. A white board from the Dollar Store and double sided tape hangs it on the fridge door. The last couple of items of maintenance where “Rear tire valve” “Check tire pressures” and “TV antenna”. My anxiety disorder plays havoc with my maintenance items. If you have never suffered with it it seems kind of weird. You get an idea, you know you can fix it. Then the anxiety thing kicks in and invents reasons why you might not be capable of doing it, or some hidden problems that might pop up and stop you finishing it. It's like laziness, you keep putting things off. But you aren't lazy just afraid of things going wrong. I know it's happening and I have to get over it. The best way I have found (But it doesn't work 100%) is to go lay down on the bed and meditate. I think of all the good things I've done in the past. Rebuilding engines, making a motorcycle out of a pile of parts. Then I tell myself that if I can do all of that then fixing the rear tire valve is easy. If I get into trouble I can always call the tire shop's mobile repair guy like I did last year when the Rexhall's tire inflation extenders had problems. So all fired up I went out and tackled the job. 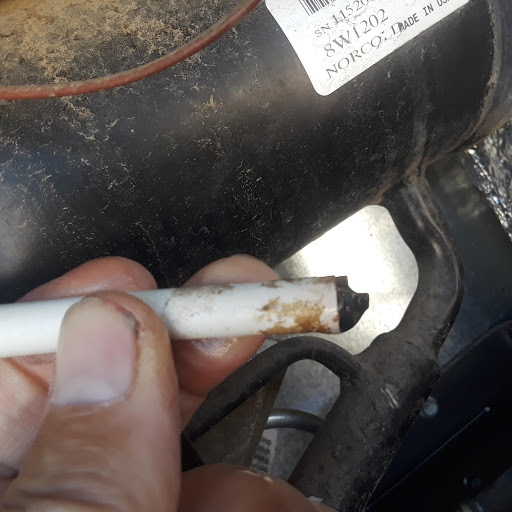 Turned out to be a loose Schrader valve core. I checked all the tire pressures, adjusted the ones that were slightly off and packed up my tools. Success went to my head and I was soon up on the roof replacing the coax cable on the regular TV antenna which had suffered from UV damage to the insulation. As a reward to myself I went and meditated some more and told myself how good it was to get things done. In order to watch it we need access to either DirectTV Now or ESPN2. Last year we did DirectTV Now but it didn't work well for us. The "Fixed" satellite dish that had to be aligned manually each time. Self aligning satellite dish on stand. We were all set to hit the road. Clive and Jean our new English friends were in another park in Casa Grande and we went to visit them there. We took them to the Elks for dinner where they met the whole crowd from Sundance. 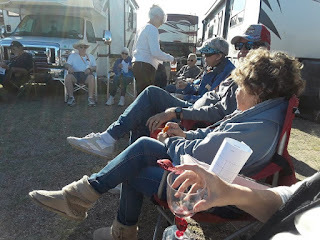 The happy hour that we postponed 2 weeks ago due to cold weather and high winds was rescheduled on Wednesday and we had about 30 people having a great time. A final game of darts and the next thing we knew we were finding places to put everything, storing the Fiesta again pending settlement of the law suit with Ford (Again) and filling the rig up with diesel. It felt good to be setting out for the summer once more. This will be our 4th year “On the Road” the basic plan is to spend a week in Yuma then about a month in the San Diego area catching up with friends. We already have invites to a birthday party and a “Bacon Fest” with a group of friends. Add a “Shanty Shakers” breakfast and Rally for good luck and we will probably be surprised how fast the time goes by. After San Diego is a little vague. We are aiming at Oregon and Washington then Idaho and Montana before turning south and Casa Grande for the winter again. But the “No Plan Kids” of course have NO PLAN!! Although we don't like Interstates there is little choice going from Casa Grande to San Diego and 175 miles seemed to fly by. This is our first full year in the new Monaco Cayman rig. The big diesel in the back is so quiet. The airbags have you floating along with none of the jolting crash when you hit bad spots in the road. Instead of shouting over the gas engine at 40 mph as we climbed several steep grades, we chatted, laughed and reminisced at 55 mph on the steepest ones. I think the Monaco is growing on us. We still miss the Rexhall though, it certainly did us well for the first 3 years of our fulltime adventures. The two of us were so happy being back on the road we were giggling and laughing the whole way. In Yuma we like to stay at the Escapees KOFA park. 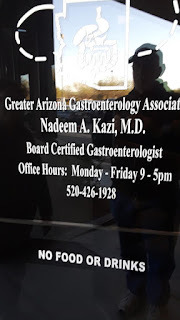 Generally we drop in twice a year on our way to and from Casa Grande. 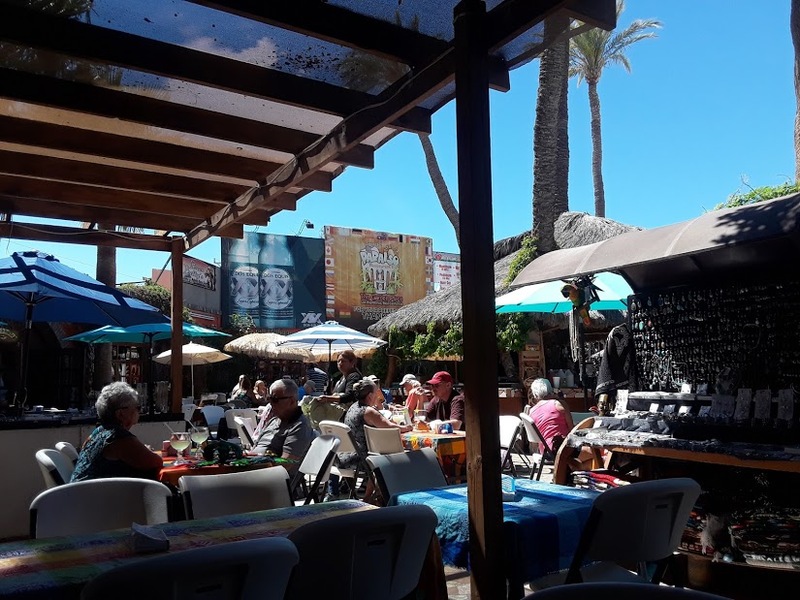 Very reasonably priced with excellent facilities, it provides us with a base to revisit our old haunts at the Prison Hill Brewing Company, Da Boyze Pizza, Arizona Marketplace, Algadones Mexico, the Yuma Elks Lodge and several others. A nice big site at the KOFA RV Park Yuma. 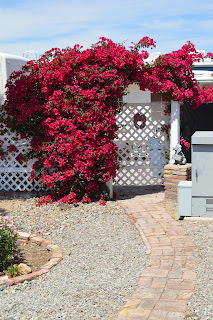 We bought our Rexhall here in Yuma and had regarded it just as a hot dusty stop along I8. 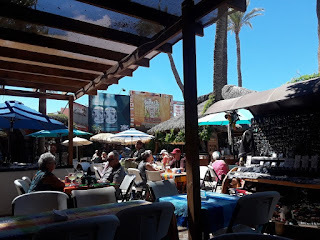 After exploring it we have come to love the place and I think if we got tired of Casa Grande we might try wintering here. 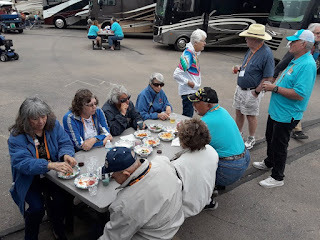 And then at the weekly Ice Cream social at KOFA a couple from Alberta we met here last year walked in and we were chatting away like old friends! So stay tuned for more adventures! 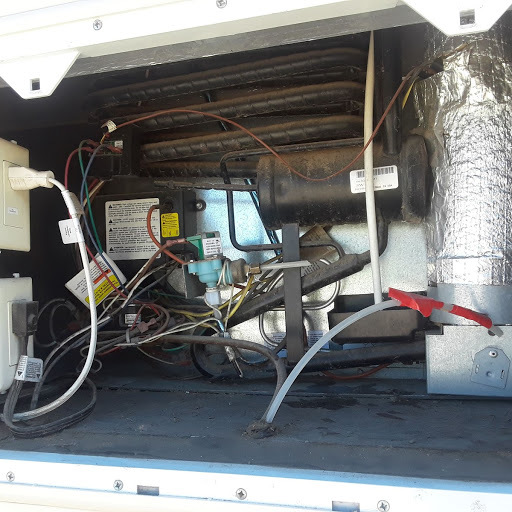 Our new to us rig suddenly had water running down the floor when we move out of our winter quarters in Casa Grande AZ. We had no idea where it was coming from but at the next stop we traced it back to the refrigerator. After mopping it up we found that the defrost tray under the cooling coils was full of cold water. The refrigerator has an automatic defrost cycle to prevent buil up of ice on the cooling coil. 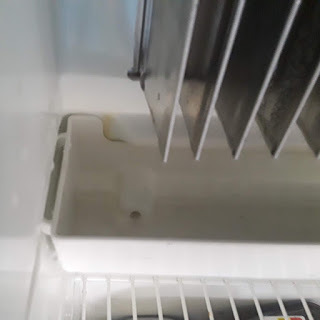 When the ice melts it drips into the tray underneath and that has a drain in it to prevent the water overflowing into the refrigerator. Except ours wasn't getting out of the tray. I had to turn off the fridge and take the top shelf out before I could see the drain hole over on the left side. 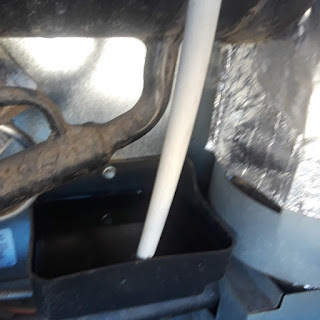 I though about blowing the blockage out with canned air like you use on computers, but I didn't have any. More thought and I came up with a roll of auto electrical wire. That fit insde the drain hole and I pushed it way down but it stopped. I didn't know if it was the blockage or something else in the drain tube. Outside I removed the panel that covers the back of the fridge. Inside was pretty confusing. Close examination showed a white tube going into an open black pan. On the bottom of the tube was a plug and some nasty gunge. After a little cleanup I saw there was a plug in the end of the tube. When I pulled it the water in the tube drained into te pan and the tray in the fridge emptied, Voila!! 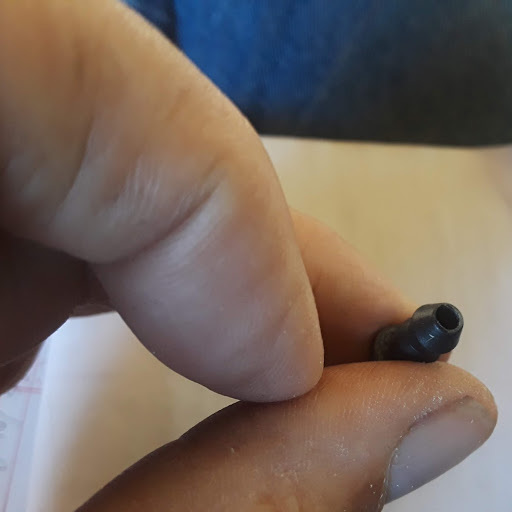 Looking at the plug I saw it had a large hole in the top and a small hole covered by a little inverted “U” shaped plastic piece. Inside the plug was full of a nasty spongy substance. By using a pin carefully I was able to pull out the stuff and clean everything up. Once reinstalled everything was fine again. No more wet floors. We dug out the maps and sketched out a route for the summer thru California, Oregon and Washington the across Idaho into Montana. Now we only have one problem. We want to get going!! Our ambition was realized and we got going. Not far, just 80 miles or so to Tucson for the annual Escapades Rally put on by our favorite Escapees RV Club (www.escapees.com). We met up with our great friends from the Shanty Shakers the San Diego Chapter of the Escapees. 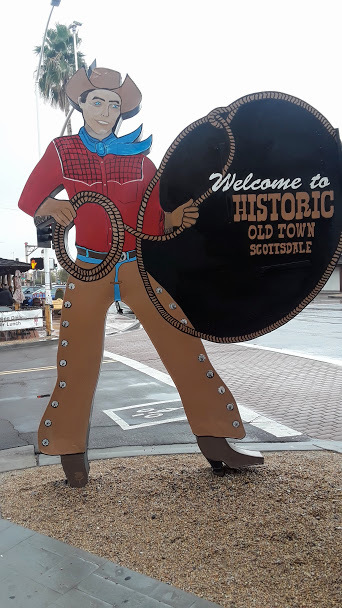 To get parked next to each other at the rally site we had to drive in as a convoy so to make things easier we all dry camped at a truck stop/bar/restaurant called the Spotted Bull eatery in Vail AZ, about 5 miles from the rally. There were 15 rigs in the convoy and when we got settled in we found all the other Shanty Shakers who were on staff, plus more who arrived on their own. We had nearly 50 people with us! Dry caped at the Spotted Bull Eatery. 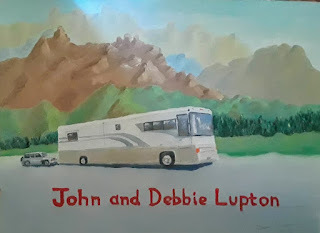 At one evening event Debbie Lupton introduced us to Clive and Jean Munro who are from UK and had just arrived 2 weeks before, bought a truck and 5th Wheel trailer and were on their way to the West Coast. Naturally we adopted them! It turns out they are staying in Casa Grande after the rally so we will be showing them around that town too!! 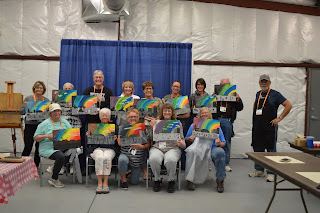 Busy wasn't the word, we were just rushed off our feet all week with me teaching 2 painting classes, entering 3 photo's in the photo contest, volunteering at the sign up for the contest, attending a seminar, enjoying the RV dealer's Happy Hours, the Shanty Shakers Happy Hours, meeting friends from all over the place, meeting new friends, fiddling with our new RV Satellite TV installation and the Rooftop TV antenna with Scott Pearson, getting John Lupton to install our new surge protector and in return painting him a “Shingle” to place in his window. The line for free booze at the RV Dealer's Happy Hour. That didn't include all the entertainment put on for the rally or the Chili Cook-Off (nice Chili Suzanne!) or shopping for supplies for the painting classes!! We thought we stayed busy in Casa Grande!. This has been a fun and very crazy week. It will be a pleasure to get back to normal next week but then again we will be off for the summer April 1st and more adventures are around the corner. 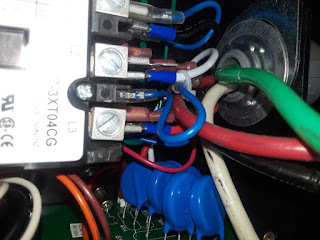 I'm glad John was available to wire up this!! Our past caught up with us when friends from our motorcycle days in San Diego showed up. Ralph and Crystal started full timing last May and we have been hoping to catch up with them.This was the time and they had fun along with Solo their Corgi puppy. Archie and Ellaine from the same group arrived unexpectedly too so we had lots of catching up to do. Shanty Shakers drinking their own booze! Bruce and Sue were working the information booth, Marty and Peggy gave a seminar on Veterans Benefits, John was on the sound crew while Debbie was setting up the rooms for seminars, Matt and Carol were coordinators. Rey and Ron were driving the shuttle carts. All in all a very active group of people and a joy to be with. Got to go right now. More parties to attend!! If we don't see you or talk to you before the big day be assured that e wish each and every one of you a Merry Christmas! Oh wow, is it really that long since I posted a blog!! They say time flies when you are having fun and we have been having fun! We hooked up with all our friends here in Sundance and got back into our winter activities. Shuffleboard, Darts, partying with the friends! Christmas and New Years were hectic what with parties, dinners, invitations to friends houses, the Elks. My liver was glad when we got it over with! We have had a few chores to do on the new rig. A small leak in the bathroom drove me crazy for a while. I recaulked the roof penetrations a couple of times but because it doesn't rain much here it took several weeks to discover it wasn't really fixed! Eventually a product called “thru the Roof” from Home Depot seemed to have fixed the problem. But a month or so later we had torrential rain and it got back in again. I had puzzled over the difference between the Rexhall roof and the new one. 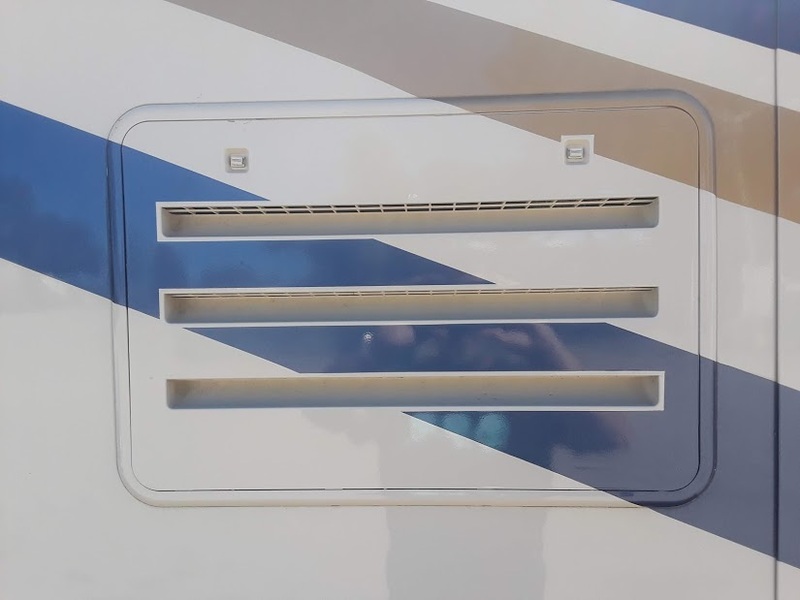 It took me ages to realize the new one has no MaxAir rain covers! New ones arrived extremely quickly and another examination and application of Thru The Roof together with the new covers will hopefully do it, maybe. The rig came with a built in vacuum system which didn't work when we tried it. 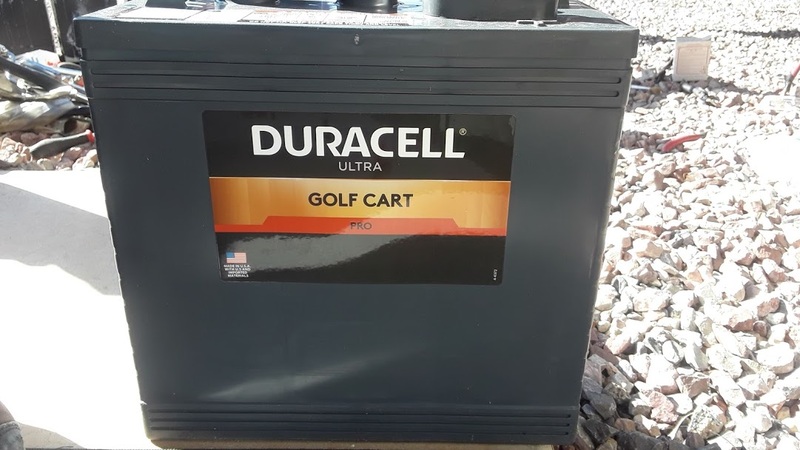 I hauled it out from under the bed and a repair place in Phoenix replaced the control board. It probably would have been cheaper to buy a separate vacuum but the built in one doesn't take up much room. Just to get out for the day we jumped into the Miata and after deciding that the Patagonia State Park was too far for a short winter day trip we decided to visit Maricopa which is about 20 miles from here. 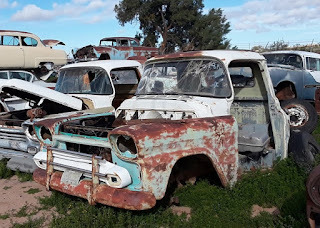 On a whim we punched in “Dwarf Car Museum” into the GPS. We've heard other people talk about it and it was on a recent episode of Jay Leno's Garage. What is a Dwarf Car? We these cars are perfect reproductions of actual vehicles but about ½ size. The gentleman who created them had no sheet metal experience before he began and his mechanical ability came from working on farm vehicles. Even more incredible is that these STREET LEGAL miniatures are made from metal reclaimed from old refrigerators! And it's free to get in. Sure you can make a donation if you want but there is no requirement to do so. If you saw a photograph of them you wouldn't know they weren't actual full size cars, it's only when you see a person beside them that you realize how small they are. Suddenly you see how small they are! Ed the creator of them is there just about everyday, and just comes up and chats about his work. He showed us the next one he's working on and one another guy is working on in the shop too. The way the steel is cut, shaped and welded to make the compound curves is amazing. They build them out of old refrigerator sheet metal! He calculates it takes about 3000 hours to build one of these. The engine and drive train comes from Toyota cars, with axles cut down to fit the width of the Dwarf Car. 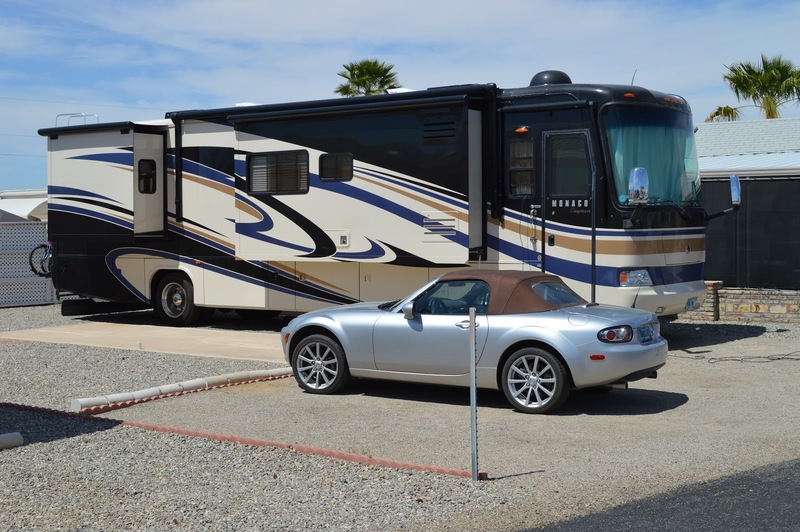 We are getting ready for the Escapades RV Rally in Tucson in March. I'm teaching two art classes so I have to get all the supplies and handouts ready for that. I discovered Jerrys Artarama online and found they had a store in Tempe about 40 miles away. That's a very tempting place! We managed to get out without going bankrupt!! I went to a “Quick Draw” event in Florence. You get 2 1/2 hours to produce a painting of your own choice. At the end of that they display the pieces and have a silent auction with the proceeds going to the Art Society. 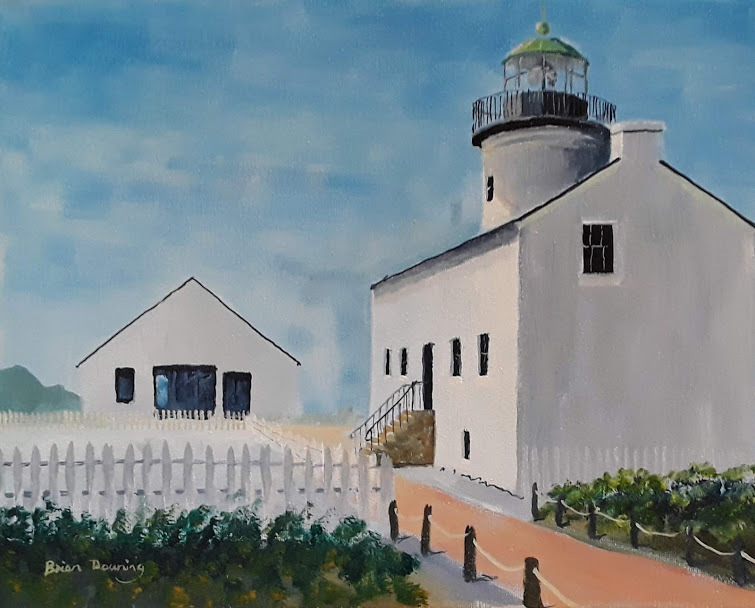 I painted an old favorite, Point Loma lighthouse San Diego from a photograph I took several years ago and it sold for $40! I even sold anther painting I brought along as a sample of my work. I think I'm only about $2 million down on the cost of all the supplies it's taken to get this far!! We are in the middle of deciding whether we want to get satellite TV for the rig. We have managed this far with a regular antenna and DVD's from thrift stores. Our only TV “Need” is Formula 1 car racing. We both like to watch the races from around the world and unfortunately only ESPN2 show them. Last year we used “Direct TV Now which was iffy. Sometimes you couldn't get the race and other times we found we had the Spanish feed! It comes over the phone lines so if we streamed it to the big TV we used all our data up, otherwise it was watching it on our phones. 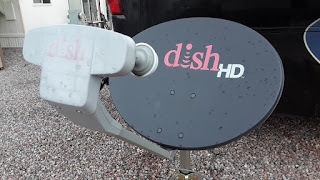 We think that Dish TV will be about the same cost as Direct TV Now and we'll be able to watch other channels than we would get over the air. Getting the cable company's equipment out and the wiring in the rig restored to where it was before they did the install was a major problem, it wasn't helped by the fact that the coax from the roof antenna was apparently bad so lots of time was wasted between them finding the cause of the lost antenna signal and 3 of us searching for fuse boxes after they blew the fuse that feeds the signal booster! We found 3 fuse boxes around the rig eventually and the one tiny fuse that had blown. 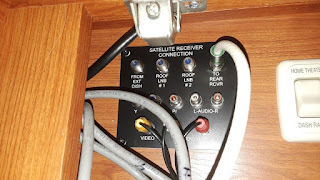 I was down to do the satellite installation. We renewed our Good Sam Club membership in January and they sent us a $25 gift token for Camping World. When we got there they had refurbished Dish receivers on sale for $50! We bought a use antenna and tripod for $45 on Craigslist, a signal strength meter on E bay and 50 yards of satellite grade coax from Home Depot. 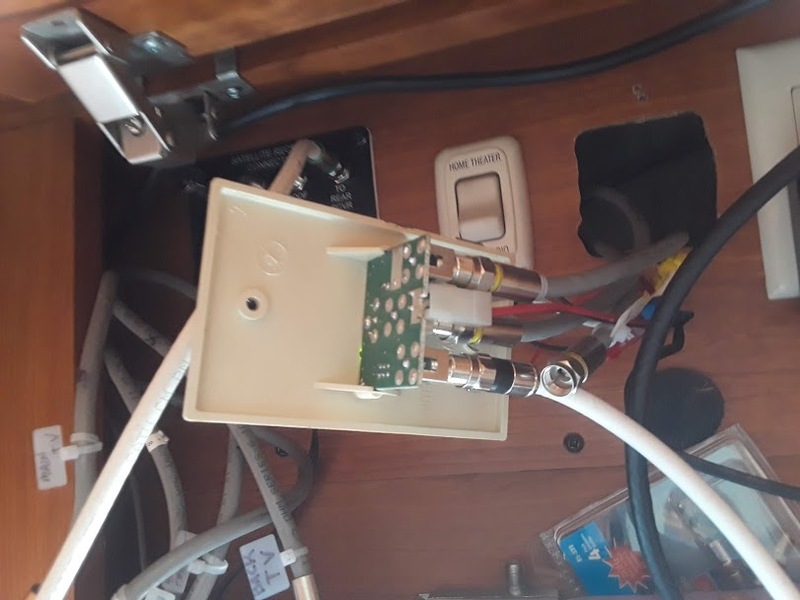 First I had t find where the outside satellite connection came into the cabinet inside the rig. YouTube provided the method of isolating which of the many it was. I hooked everything up and, and, NOTHING. No signal on the meter or at the receiver. “Total Signal Loss” message on the TV screen. Various calls to a surprisingly helpful Tech Center finally had me re route the coax thru the slide direct to the receiver and a small realignment of the dish before we were getting TV again. The sedentary life has advantages and disadvantages over wandering. I don't know whether doctors visits are an advantage. It was ten years since we'd had colonoscopies. That was a disadvantage!! Barb did her's one week and mine was the next. Now we have to wait another 5 years before we “Enjoy” that experience again. Wellness checks and a bone density scan for Barbara, then we were declared fit for the next 12 months. Larry and Marylin Forbes dropped by a couple of times and stayed at Sundance this last time. They know lots of people who are involved with Escapades the SKP Rally coming up in March. Next thing we were invited to a Happy Hour at the home of Bill and Jan who it turned out live just down the road from us! Good time were had by all. Potluck dinners for the Shuffleboard and Darts players left us with full bellies and an urgent desire to take a nap. Oh the hell of being retired!! Suddenly it's March first. Escapades is only 2 weeks away and we leave in 4 weeks. Where the heck did the winter go? Even the weather is getting warmer after what is the coldest winter we'e had here in the last 5 years. We dug out the maps and sketched out a route for the summer thru California, Oregon and Washington the across Idaho intoo Montana. Now we only have one problem. Transitioning from Roaming to Parked modes. “Welcome Home” says the lady in the activities office. It really does feel like home. Scary how fast time goes by sometimes isn't it? Were in the middle of December already and rapidly heading towards Christmas We've been to see our financial guy, got a spare key for the Miata that we've been promising ourselves we would do “When we get a chance”. New wheel covers have been bought and the arrangements for the rig to be in “Storage Mode” for the winter are all set. For the first time since last April the outside mats, chairs, the grill and my art easel are set up. Seems like the anchor is firmly planted. Our friends Scott and Suzanne dropped by on their way to Texas for the winter. They are busy as always, having gone the “working on the road” route. Scott is trying to get his Mobile RV Technician business set up and having to get certified in different states to be able to work on propane systems etc. 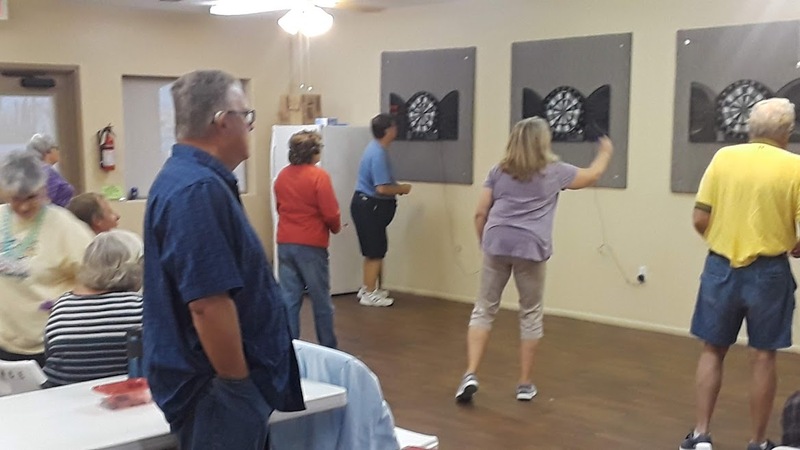 We dropped in on our first darts night and there weren't many people there. A couple of weeks later there are 30 or more. Lots of familiar faces and long talks about what we all did this summer. Shuffleboard is going again and the crowd is growing every week. The skills we developed last season have rusted a little but we are getting them back every time we play. My camera club has had it's get together and we had our first assignment. “Black and White” was the theme so I'm spending more time looking for some image to catch my eye. Art is back too with the Casa Grande Art Association “Studio Tour”. 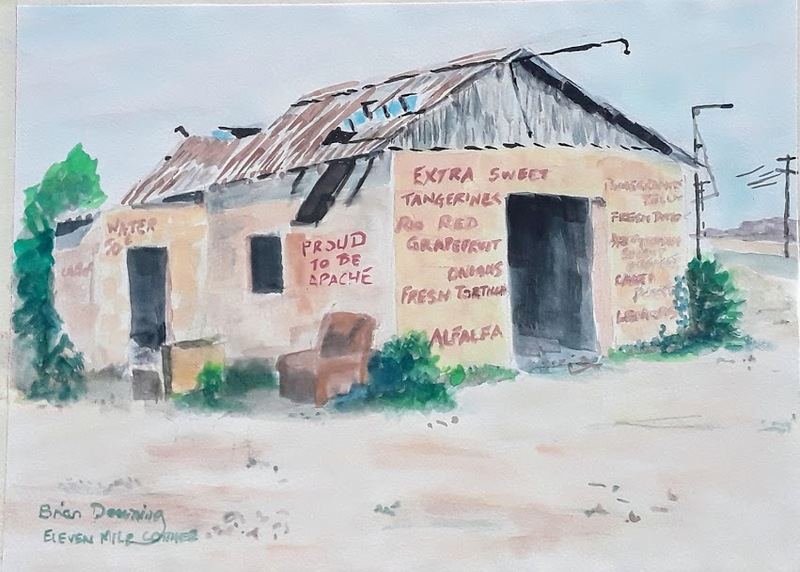 The local artists opened their studios and houses to the public. We wandered from one to the other looking at the paintings and crafts for sale. 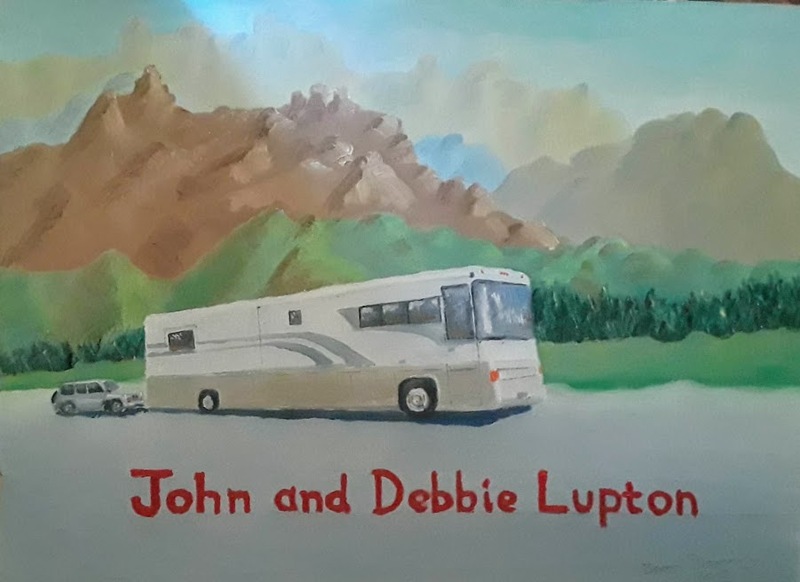 Living in an RV means you don't have any walls to hang pictures on and there is no spare room for statues or pottery, so the temptation is less. 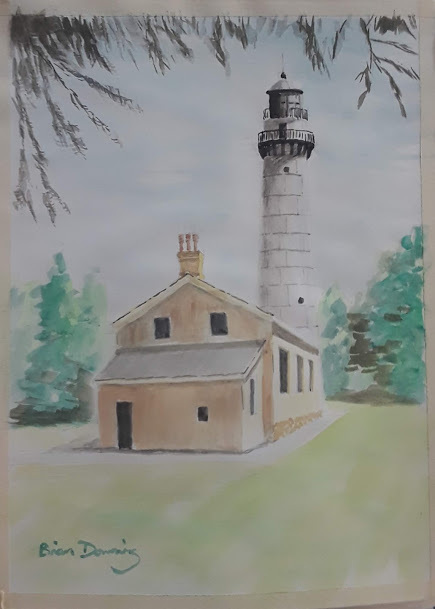 A watercolor done at the Monday art group from a photo. From the studio tour we went directly to Apache Junction for the Arizona Plein Air Society's “Paint Out” at the Goldfield Ghost Town. It's a tourist trap kind of place but the owner/manager of one of the restaurants invited us to paint from his balcony and provided us with burgers and drinks too. What a generous gesture. We got to paint “Superstition Mountain” which was spectacular but very challenging. A stop at the local Elks Lodge on the way home made a pleasant break in the journey. More art at the RV park on Thursdays, a new group called the “Urban Sketchers” are Tuesday and they led me to yet another art group who meet on Mondays! 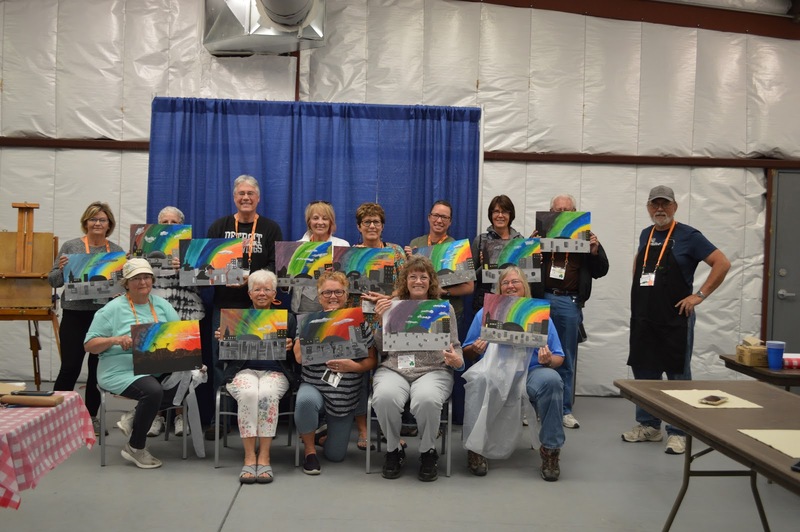 Oh yes and the Wednesday Casa Grande Art Assoc “Open Studio” rounds out the week. Meanwhile Barbara has been catching up on doctors visits, hair dressers, knitting for the grand kids and socializing. Then she joined the choir for the Christmas Concert. They sounded great. 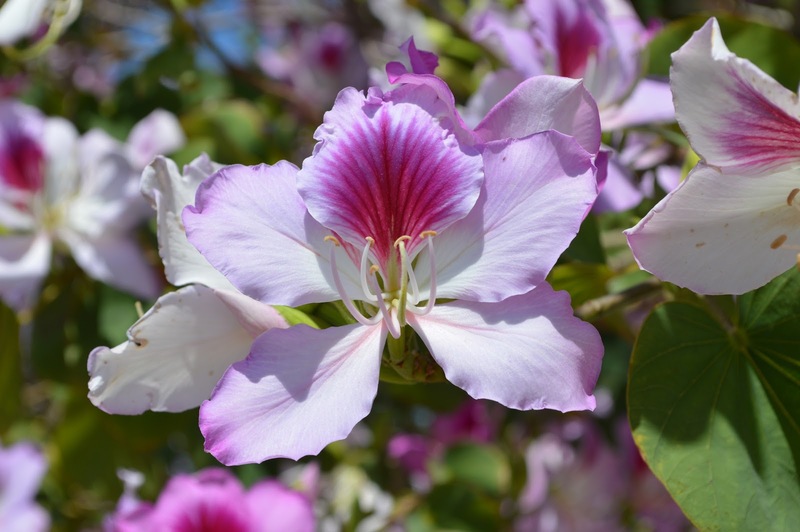 Such a busy time, yet I am getting “Hitch Itch” which is the desire to be on the move again. It's a bit strange to be not picking out a place to stop for the night and a destination for the next day. I have to tell myself to sit back and relax, but it's not easy to make the transition. I began some basic research for next year which we have decided will be around Oregon and Washington. That made the itch even worse! 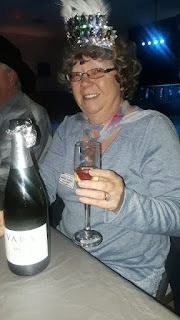 Our friends Paul, Karen, Bill, Terry, RuthAnn, Ed, Al and Marie have made sure we get out to the Elks Lodge for dinner regularly and to various parties, dances etc., which helps dispel some of the “wanderlust” too. So this is where we are at. If we don't see you or talk to you before the big day be assured that we wish each and every one of you a Merry Christmas!